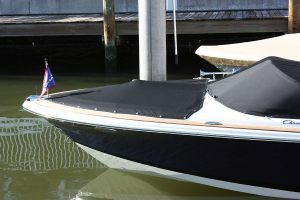 A boat bow cover, also known as a boat tonneau cover, is designed to snap on to the forwardmost section of a boat’s hull. On many sportboats, this area is open with seating for passengers. But, when your boat is docked or stored, it needs to be covered and protected to keep water and other elements out. If your boat bow cover wears out or is damaged, you can’t just walk into your nearest marine retailer and buy a new one. The original was form fitted, specifically for your boat. The exact shape and dimensions are needed to get a replacement cover that not only fits but will protect your boat and keep Mother Nature out. Depending on the brand of boat you own, there’s a good chance that AmeritexDirect made the original tonneau or bow cover for your boat, and we can sell you a replacement. It will be custom sewn to the exact same specifications as your original bow cover and shipped ready for installation. Most importantly, your new boat bow cover will not be an approximate fitting aftermarket solution, but an exact replica of the original made for your boat. Find out if we offer a tonneau or bow cover for your boat here.